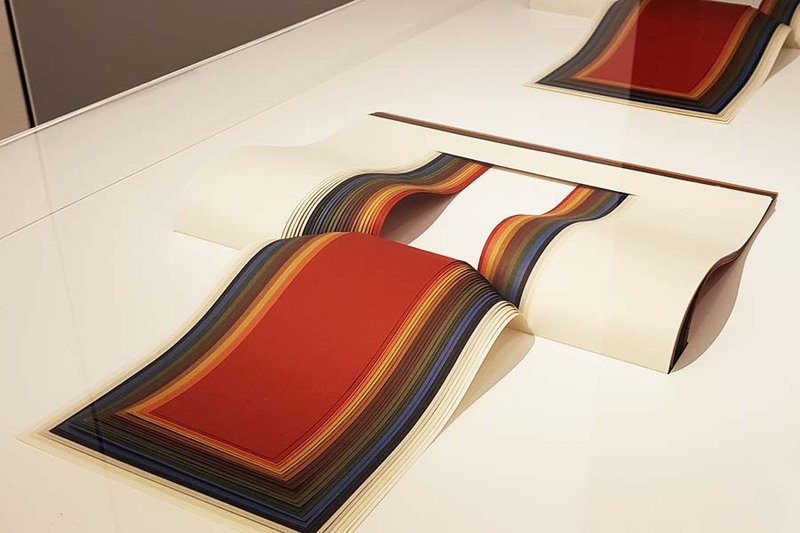 TAKEO Paper Show “SUBTLE” was originally held in 2014 in Japan as part of the exhibition series that has been presented by the Japanese paper company, TAKEO, since 1966. It was brought to the newly opened “Japan House” in the heart of Hollywood, Los Angeles, to quietly but powerfully showcase the potential of “subtlety” in a way that will completely change your perception of what paper is really about. The person behind this delicate design magic is an acclaimed graphic designer, Kenya Hara, who is known for his inspiring branding work for MUJI. He is the Art Director of the Japan House, an affiliate of the Foreign Ministry of Japan, established to disseminate Japanese aesthetics based in Los Angeles, London and San Paolo. Hara has been working with Takeo for long time as a graphic designer. 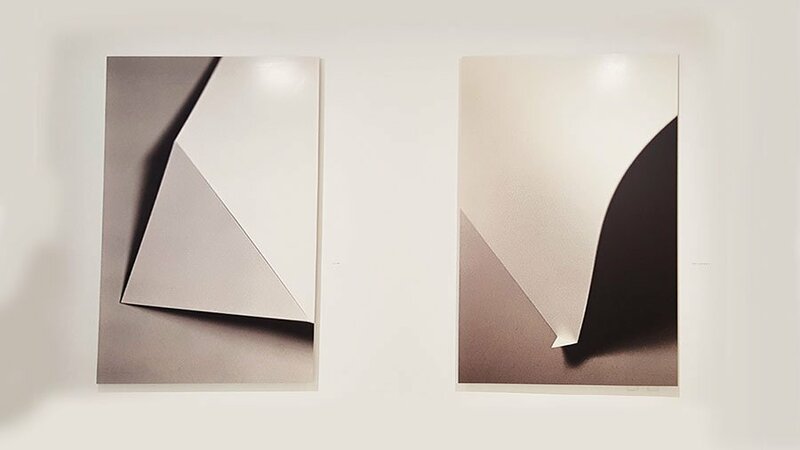 Before I visited the exhibit, I only had a very vague idea what to expect from a paper show titled “SUBTLE.” But once I was there, my body and senses immediately knew what it meant – as Hara must have envisioned. If you read Kenya Hara’s inspiring book “White,” you may notice that there is a lot in common between “subtle” and “white,” and paper represents the beauty of both aesthetics. 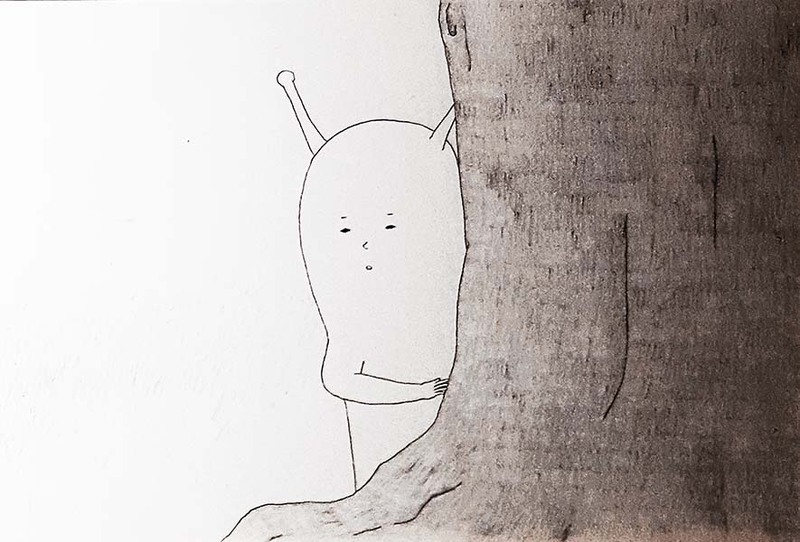 Left: Photo by Yoshihiko Ueda, who has done many MUJI advertisements. 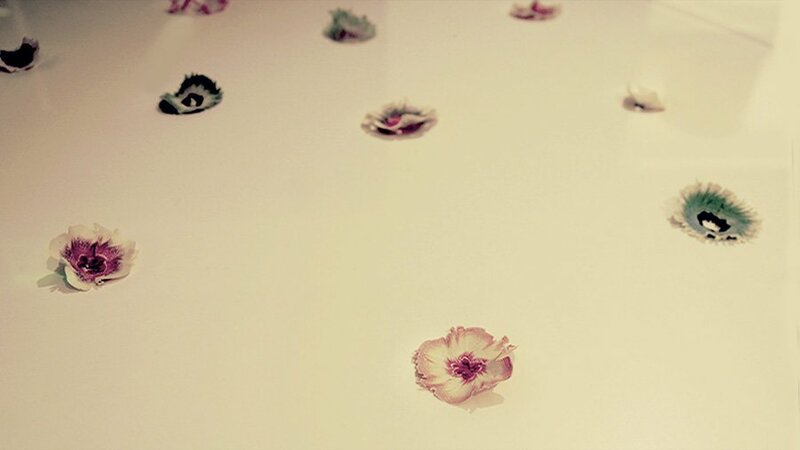 Right: Paper flowers by Haruka Misawa. See below. It’s not the paper itself that is subtle, Hara explains. 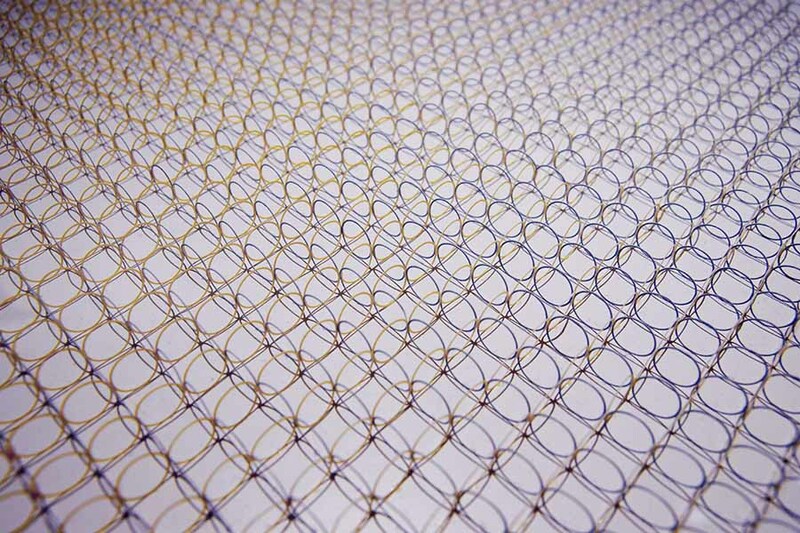 Rather, it is the way our senses are stirred and awoken by the delicate characteristics of paper that is really subtle. If we think twice, paper is extremely fine and fragile compared to other natural materials such as stone or wood. You can change its shape by just folding a corner with your fingertips. Or, because of its overwhelming whiteness, even a smallest smear will damage paper’s pureness forever. Any of us can change the destiny of paper with one small move. But despite its casual nature, the changes made on it are irreversible. Be it long-lasting beauty or a damage that can never be corrected, it will stay as if you had pressed a branding iron on it. In that sense, paper is a unique and incomparable medium that records the subtlest actions as a decisive moment. It is this “once-in-a-lifetimeness” of paper that makes our senses aroused, focused and alert even toward the smallest and slightest moves. Hara reminds us that it’s not the phenomena themselves that are “subtle.” Subtle or not, they exist and happen. It is our sensitivity, or our ability to perceive “subtle” things, that make subtle things subtle. – “Subtle” is on us, not on the side of the objects. Reflecting such a philosophy, the creations you see at “SUBTLE” are focused on the characteristics of paper as a “catalyst” to stir our senses, not so much on leveraging paper as a material to make objects. None of them try to defy paper’s limitations and achieve overly complicated, large or excessive details that may make you exclaim: “Wow, is this made of paper!” Instead, they may look anti-climacitc. But that’s the point. In a world of “SUBTLE,” the climax is not on the side of the objects. It has to emerge INSIDE us when we fully activate and mobilize our own senses. “SUBTLE” is such a sensuous experience. The “Creation” section showcased works by artists, designers and architects. Find how diverse and profound “subtlety” can be when it stirs creators’ inspiration. When you sharpen a pencil with a hand-held sharpener, you are left with thin, wrinkled layers of wood that look like flower petals. 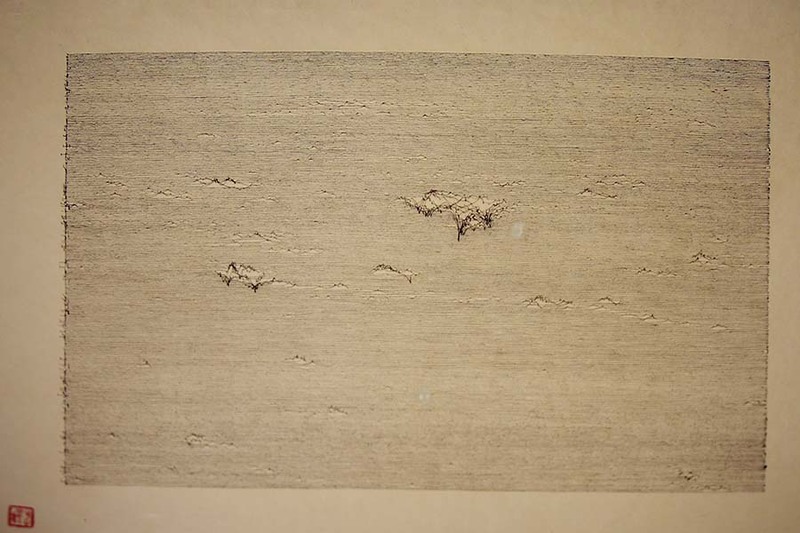 That is what Misawa created here, by printing color gradations on TAKEO’s “Biotope GA-FS” (see below), wrapping them around a core as if making a pencil, and then sharpening it using a pencil sharpener. 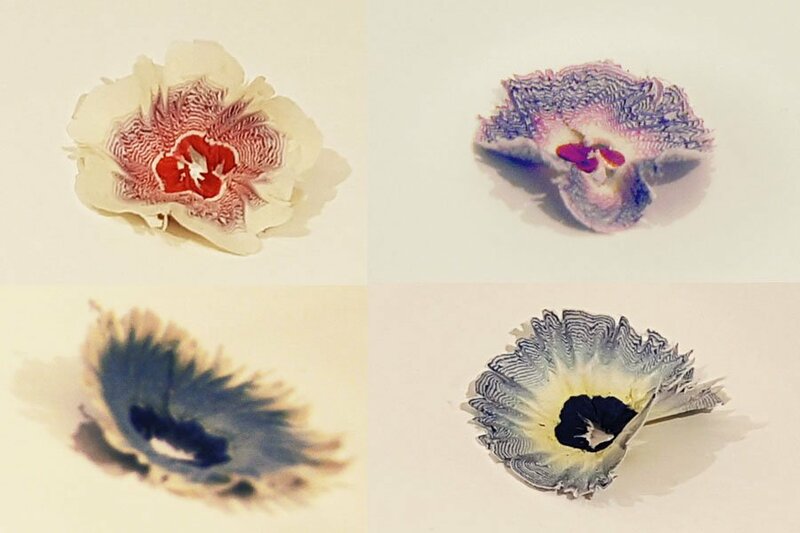 Each flower is unique in its shape and pattern. 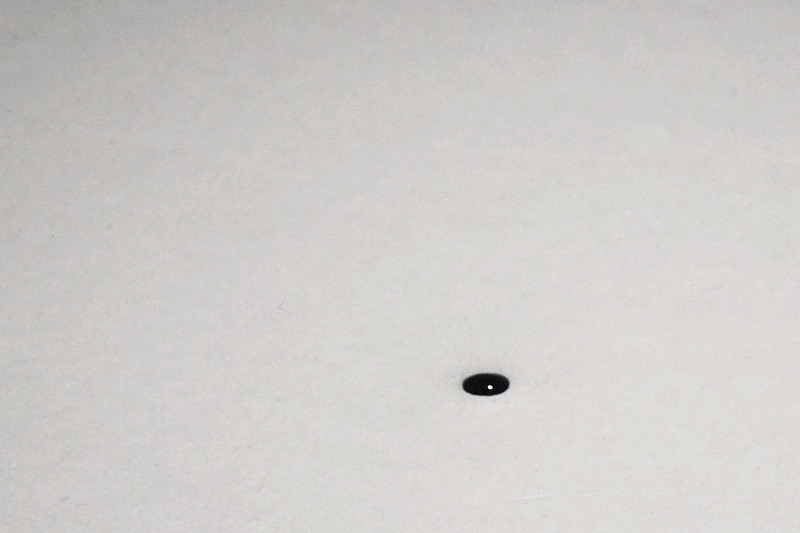 A man rolls out from the corner of a piece of paper, starts walking, and eventually goes back to become part of the paper. – It is the picture that came to my mind when Hara called me to offer an opportunity to join the exhibition using state-of-the-art paper cutting technology, remembers Yorifuji. 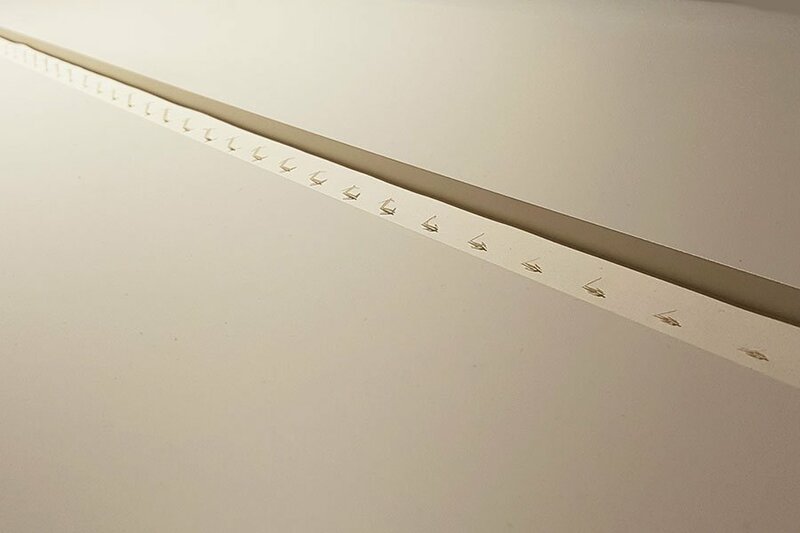 The technology could cut a 1/2 inch-sized man with precision, so he chose a significant restriction: he placed his creation on a strip that was only 8mm deep and 40 mm wide. “With such a minuscule scale, I needed to eliminate almost all the options for expression”, Yorifuji says. “The only thing that remained was the physical reality of paper and my will to express something.” But what should that “something” be? He tells us that the project had become an unexpected self-questioning process. “When I was a child, I was fascinated by the images I saw through a microscope”, remembers Hara. He was especially drawn to the way that light enveloped the specimen, because it looked as if it added delicate opaque coats on already translucent objects. 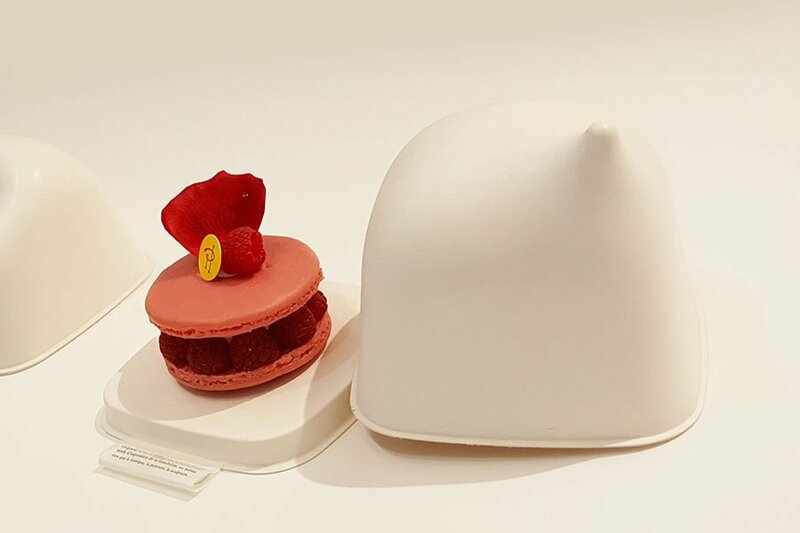 Hara’s creation “Chocolate’s Hats” were made by applying laser-cutting technology on very thin tracing paper. (The actual object is about 1 inch in diameter) In a microscopic world, gravity interacts with objects differently, observes Hara. Even fragile tracing paper can be self-supporting, and mass and weight exhibits totally different quality. 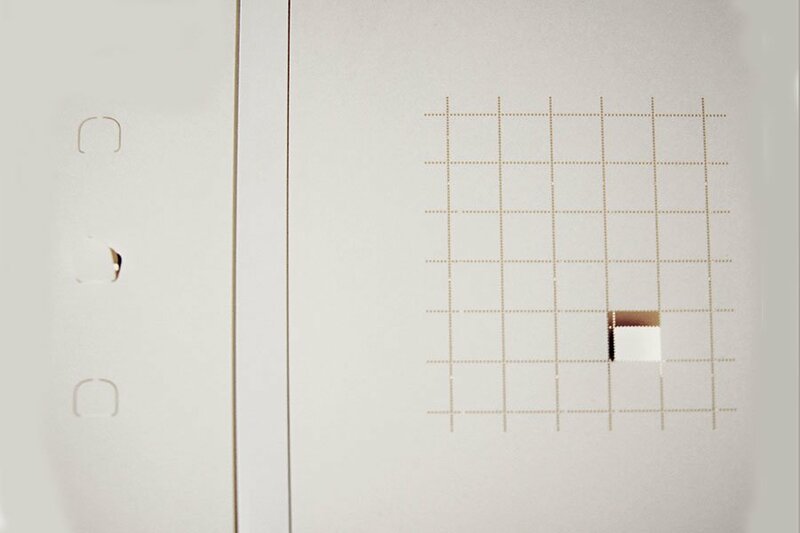 Paper is prone to “accidents,” observes artist Motohiro Tomii. Once perfect and pure, the status of paper can easily be tainted with your fingertips, and the damage will be irreversible – even when it can still be used as paper. Such damage will leave you in a kind of arrested disappointment because you are torn between retained functionality and lost beauty. In order to emphasize paper’s unique property to “record” an accident on it, Tomii made a small triangle – maybe less than 1/2 inches – in the middle of the sheet of paper. Albeit small, it decisively and forcefully rises upward. This could be one of the simplest form of the “tension created by potential,” Tomii says. You are here to witness how such an “accident” will evolve on paper – in your imagination. 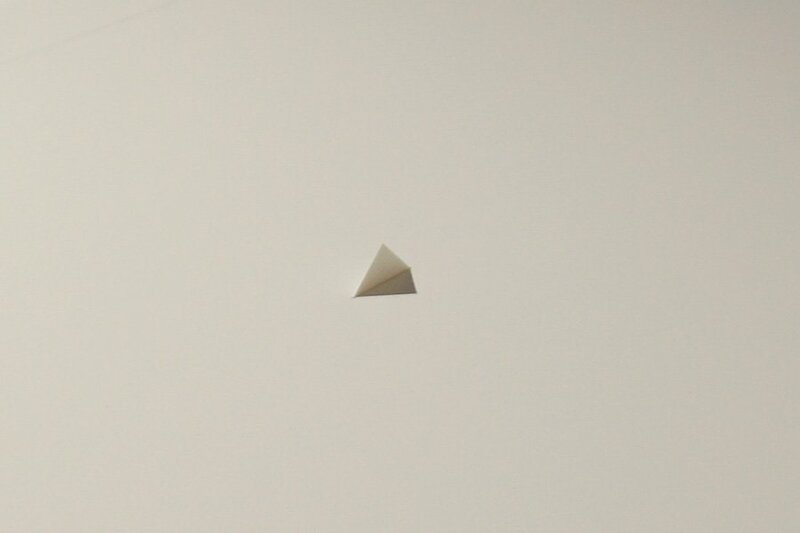 “This is about paper as a flying object, although it has nothing to do with aerodynamics. 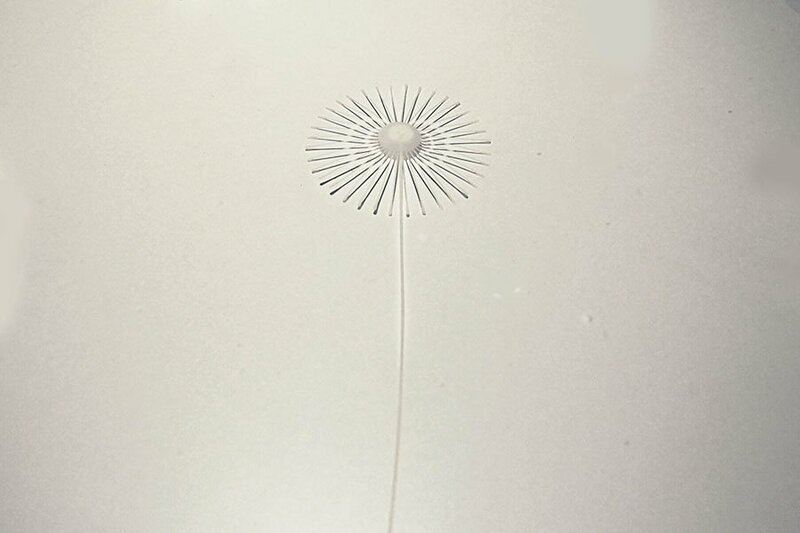 I was interested only in the paths different paper objects take in a couple of seconds from the time I release them in the air till they land,” explains Misawa, who also created “Paper Flower” shown above. Defying gravity, they try to stay in the air as long as they can, leveraging the subtle folds and curves she has added to each flying object. “Since I am a graphic designer, it’s my job to deal with clear messaging. 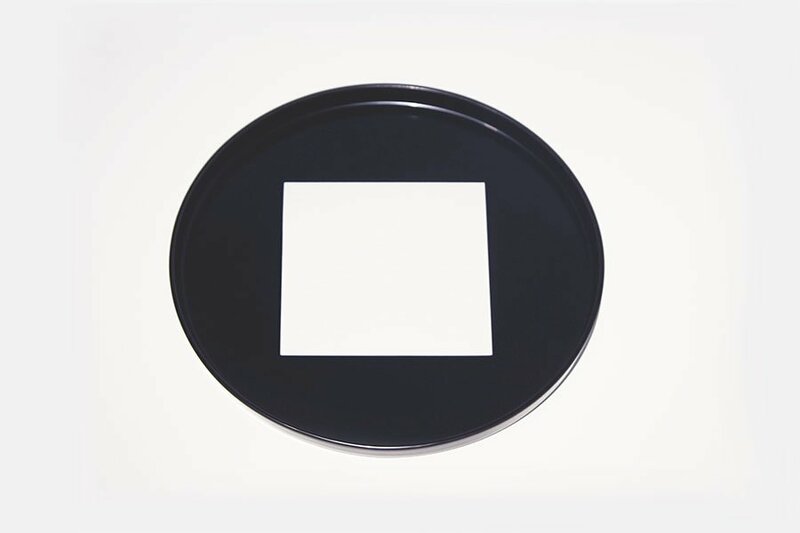 But with “SUBTLE,” I explored an ambiguous message, not only in its meaning, but also how it looks. 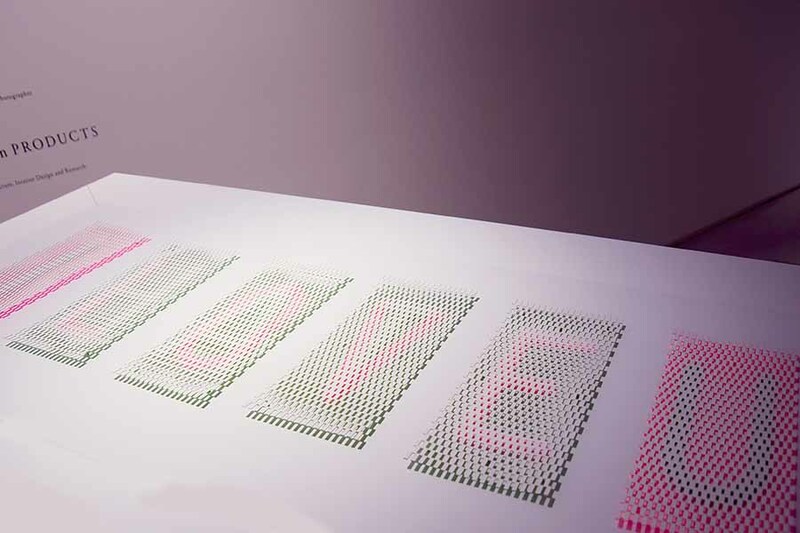 The real letters are on a white piece of paper which blend with the layers of vivid pink/green lattice-structured paper that let the virtual letters emerge.” The two blend ambiguously, as if they are in a negative-positive relationship. 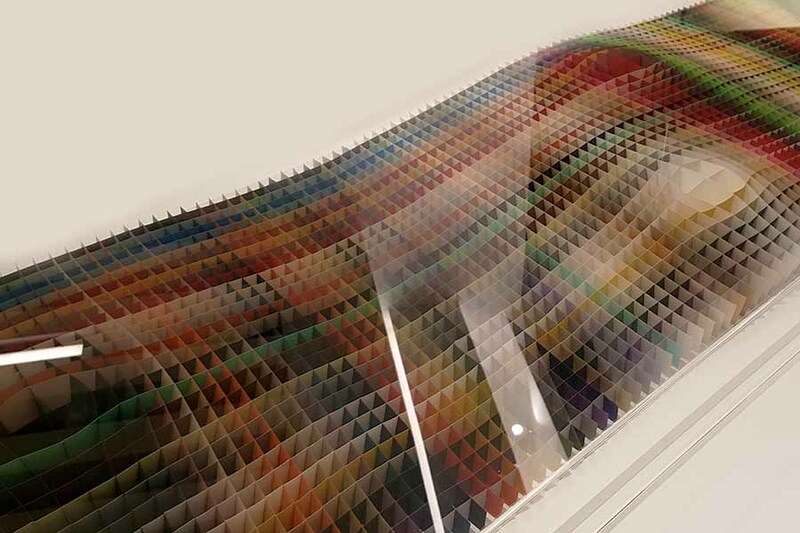 The “Collection” section focuses how paper behaves and how the Japanese have been leveraging each behavior to create products and record the work of art. 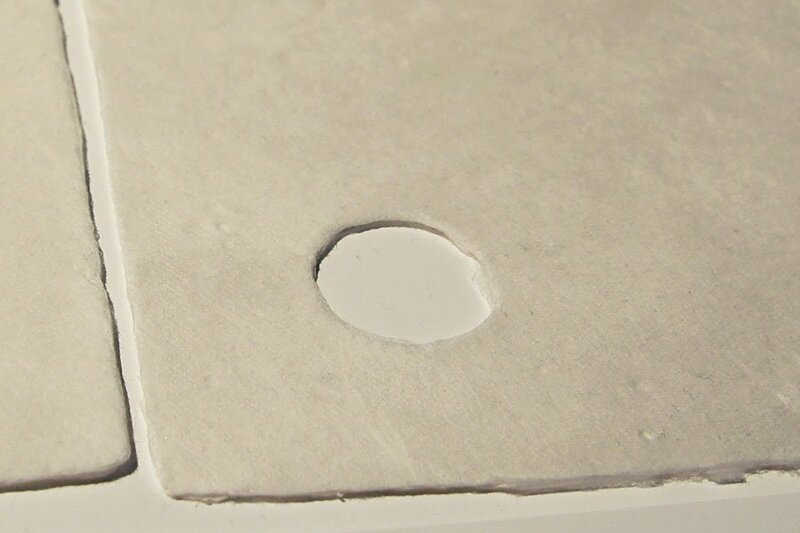 Molding can maintain pulp’s natural texture. Kenya Hara produced pulp packaging for French chocolatier Pierre Herme, leveraging TAKEO’s paper molding technology that has been used to produce a variety of products from egg cartons to furniture. Kyuyo Ishikawa is a Japanese calligrapher who advocates the importance of “筆触,” meaning that the combination of the depth, the momentum and the angle of the brush determines the quality of output. In his transcription of “The Tale of Genji”, Ishikawa recorded the “vibration” of each and every letter as if it was actually pronounced. Calligraphy is an art of all senses, he says, and from the collision of aroused senses and the piece of paper emerges the profound beauty of calligraphy. 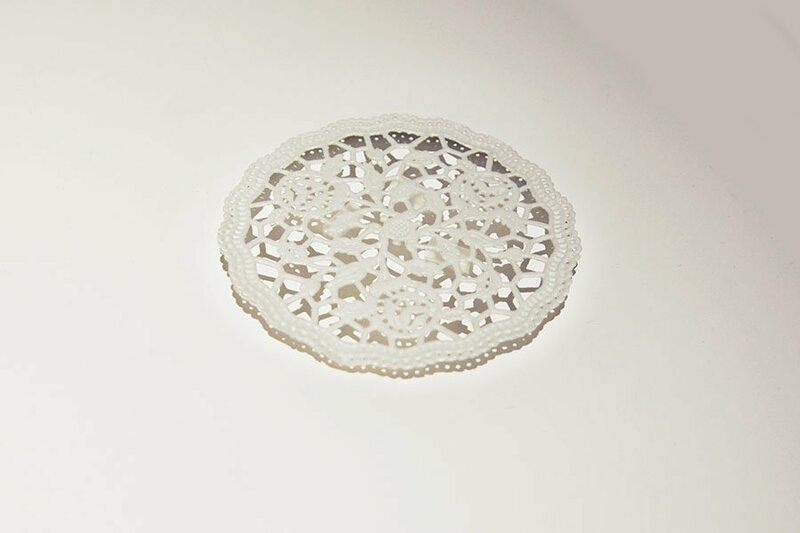 In Japan, lace papers were developed to add a festive atmosphere to European-style cakes that are made using abundant cream, chocolate or fruit that often form decorative and luscious details. “Decorate” may be one of our fundamental desires, but it becomes elusive and transient when it’s done using paper because we all know that it won’t last for too long. The Japanese use white paper that is cut crisply straight to create an independent, pristine territory within a space. Just by placing a rectangular, purely white paper on a tray very neatly, you can express hospitality to welcome guests to whom you may be serving tea or some desserts. 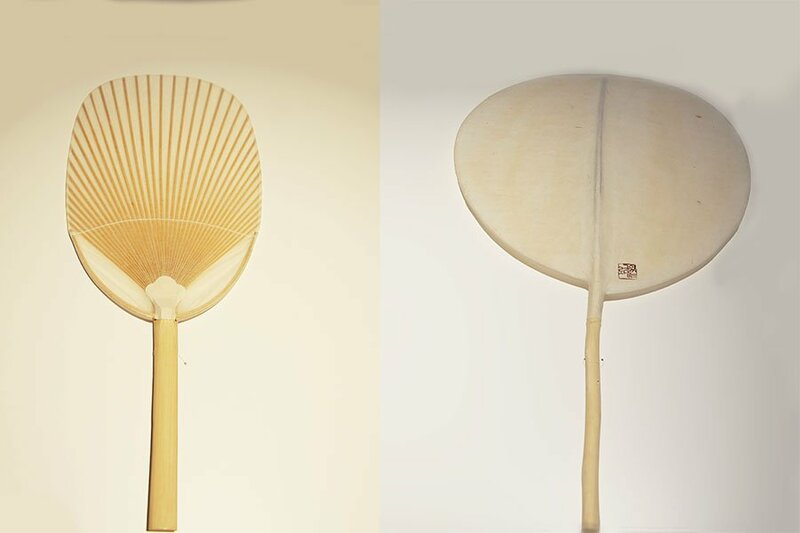 Traditional Japanese fans use supple bamboo as a structure, which is bathed in a gluey pool that dissolves washi (traditional Japanese paper) fibers. Thanks to the subtle stickiness of plant-based glue used for washi making, long fibers drift above the bamboo structure for quite some time until they finally settle on them to become delicately translucent fans. Opening a sealed envelope is a special action because it means you are destroying a carefully prepared casing that contains unknown message for you. It is a process to diligently reveal the irreversible nature of paper (and an envelope), but such a destructive action is done because you appreciate what is inside. It’s the duality of paper – fragile on one hand but resilience and powerful at the same time. The finish of the washi paper is never like machine-cut sharp straight lines. 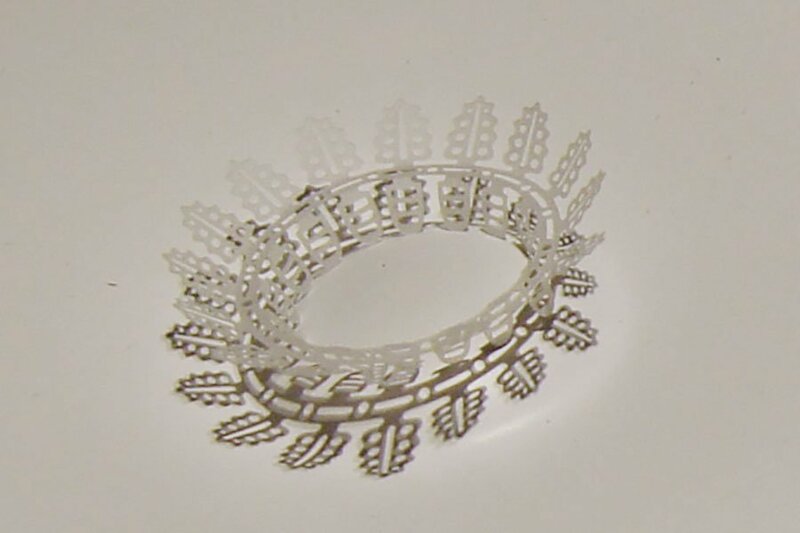 Called “ears,” the edges still maintain the interaction of the bunch of fibers dissolved in gluey water right before it became paper, as if they felt not ready to be apart from others. Whereas the whiteness, the tensile strength, and the wrinkles are beautiful characteristics of paper as a finished product, the ears quietly reveals where paper came from. The “PRODUCT” Section showcases some of TAKEO’s cutting edge products.